Flags is a freeware program written to teach the International Code of Signals flags, used by ships to communicate at sea. The program will quiz you on the ICS flags, which include letters A-Z, numeral pennants 0-9, and the 4 repeater flags (ICS actually only uses 3; the fourth one is used by NATO.) There is an optional "cheatsheet" that shows all the flags to help you get started. You also get the option of including the NATO flags: Corpen, Designation, Division, Emergency, Flotilla, Formation, Interrogative, Negative, Port, Preparative, Screen (Black Pennant), Speed, Starboard, Station, Squadron, Subdivision, and Turn; and the NATO numeral flags. Other modes will quiz you on the meanings of the ICS flags (as described in NIMA Pub. 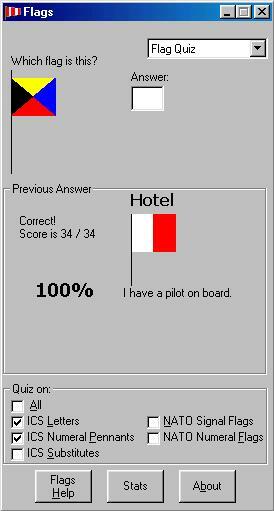 102), show you one of 1000 words spelled out in nautical flags and ask you to identify it, or just display in flags a word that you type in. Your score is kept and you can bring up a display showing which flags you got right and which ones you had problems with. I wrote this program so I could learn the flags and as a Visual BASIC exercise. It does not contain adware, spyware, virii, trojans, or anything other than a program that teaches flags.